Wood pellets are bundled energy: 1 kg contains 4.9 kWh. Two tons, therefore, correspond to around 1,000 liters of heating oil. As the chart illustrates, the highest energy need arises for drying the wood shavings. Following that is the energy needed during the production process, i.e., the power consumption for the pellet presses, the cooler, etc. A very slight amount of the energy expenditure is taken up by the transport. 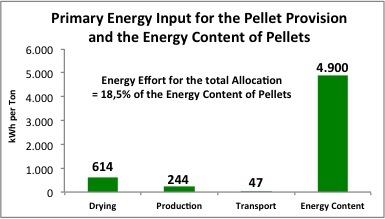 If one assumes a transport distance of 100 km from the pelletizing plant to the end customer, only about 1 % of the energy contained in the wood pellets is needed for the transport. The excellent ecological balance of domestic wood pellet production is determined by two factors: The energy requirement for drying the wood pellets is covered in nearly all of the plants through the use of wood scraps (particularly tree bark) and is therefore CO2-neutral. Moreover, the electricity input of the domestic pelletizers is based to a large degree on hydroelectric power – resulting in low C02 emissions as well. The consequence: domestic wood pellet producers only generate an average of 30 kg of CO2 per ton of wood pellets. Compared to the use of heating oil, this means a 97.7 % reduction of CO2 emissions.